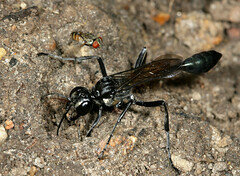 Thread-waisted Wasp, Eremnophila aureonotata, buries its prey. A Satellite Fly (Sarcophagidae:Miltogramminae ) hovers nearby. These flies deposit eggs near the burrow entrance of the wasp and the larvae crawl down and devour the prey of the wasp, and perhaps the wasp larva too. They are called "satellite" because they hover near the wasp, usually at a rather fixed distance. A closer view of this same fly is on BugGuide.